Babies and young kids can sometimes sleep so peacefully that we forget they are even there. 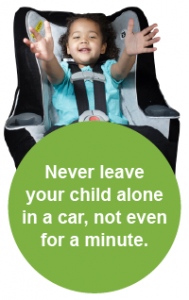 It can also be tempting to leave a baby alone in a car while we quickly run into the store. The problem is that leaving a child alone in a car can lead to serious injury or death from heatstroke. Young children are particularly at risk, as their bodies heat up three to five times faster than an adult’s. These tragedies are completely preventable. Here’s how we can all work together to keep kids safe from heatstroke. TOP TIPS: Reduce the number of deaths from heatstroke by remembering to ACT.